When I commenced full time permanent work (after 10 years of part-time or non-permanent work!) in 1974 I had to sign various documents. There was one I remember clearly. It referred to the date of my retirement in mid 2015 – July 28th to be exact. At the time I thought the date a ridiculously long way away. More immediately I was looking forward to teaching Orwell’s ‘1984’ in 1984. Even those 10 years seemed like a lifetime. Incidentally I never got that chance because I was in church ministry by that time. But today that date has arrived. My wife sang a sleepy happy birthday to me as I headed to school, the staff at school sang their rendition and a year 11 student left a delicious cake on my desk … and not only hasn’t that retirement arrived but I am glad it hasn’t. I haven’t been a victim of the raised retirement age, but rather, since the removal of the compulsory retirement age many years ago I am now free to continue working. One of the benefits of being a teacher is that students keep you young and connected. Their enthusiasm for life, their idealism and their sense of justice is a great antidote to cynicism and tiredness. Even today my Literature class and I had an ’ah ha’ moment which sent a shiver up my spine. I cast my memory back to the ‘old’ teachers of my childhood. Some were great and, I now realise, some were desperate to get out of a profession that they felt trapped in. I thank God that I am one of the former. I must confess that I am looking forward to Long Service leave later this year. But I am also looking forward to more teaching – Lord Willing. P.S. 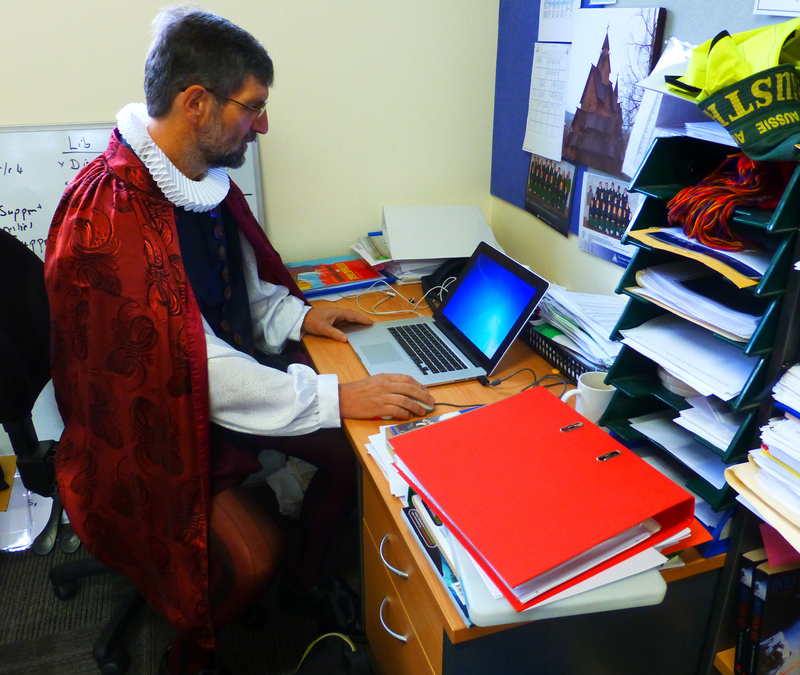 In what other profession can you dress up like Cervantes and not feel like a total chump! Happy birthday, Pieter! I hope your day and the years ahead are all wonderful! Happy Birthday!!! I am able to say that I am glad that you haven’t retired yet. As you have been such a great teacher to have throughout the years. Even though you are not my teacher this year it has still been great to see you around the place and have chats every now and again and I would have missed that if you had have retired… And may you have many happy years ahead of you whether it be teaching or retiring and spending time doing something else that you love… All the best and may God bless you in the years to come!!! Mr Stok…you should’ve told us. Congrats on reaching this milestone and keep up the good work. One of my friends felt like the Lord impressed on him the verse in Galatians that encourages us not to grow weary in doing good – I pray the Lord will give you strength as you seek to serve him.